Agreed! It would be interesting to see their transformation! Oh, btw, 100th replies! Yay! What mask should Kalmah have? Right now I'm using a Kakama. Ya too late son. I cant turn back from where I am right now. Maybe Ill redesign him sometime. Whoah! I cannot believe you are actually drawing the Barraki! I never thought about the masks they would wear, but I feel I could see kalmah with either kakama or kiril, but Pakari could work aswell. Will probably take a while for The Current Kalmah to be done, so here's a sneak peek. Everything else is pretty good though, maybe have a fancier crown? I intended for his arms to be shorter than usual. maybe have a fancier crown? Look at the top of the current Kalmah's head. I like that you took the bit of artistic license with the arms, but I think they sadly don't work from the visual stand point, and neither would in the toys themselves. And I love the new mutated version of Kalmah! But I thought they could be a bit more Rahi-like, like Rahkshi. Maybe you could give him tentacles for legs aswell, like Guurahk has? Added pictures for the Barraki and Kalmah by @Tempelbeast1 and @levva respectively! Added @Noupix's design for Nikila! Added @Noupix's design for pre-mutation Carapar, Mantax and Takadox! TTV Cast, Please Read This! Good evening. On the last Brickonicle Brainstorm, this pitch of the Barraki and Mahri Nui got mentioned, and it is possible the cast might talk about it more in the next one, of which I'm really thankful. This post is to inform the Cast of some controversial topics in this pitch, that I want to justify before they are talked about and possibly disregarded/rejected on the podcast. @Jon, @IllustriousVar please give it a look! Yes, this is a very controversial topic that I know will most likely get rejected outright, and I wanted to even remove it from the pitch, but decided against it, since it is a pitch and it's job is to flesh out every possible idea. You even suggested Ekimu being present in Mahri Nui. I am not sure how that would work, but I am ready to get Karzahni out of the pitch and Ekimu in, also because there is another pitch that does Karzahni better. Yes, this most likely does contradict the canon. My justification for this is that most of what is known about Mantax are lies and rumors. Tiro has been pitched as being isolated for decades during his reign. He may have used the mask powers to do really weird shenanigans, but it doesn't have to be a necromantic magic, because I know you will be hesitant to add it to Brickonicle, if even you'll think about it. So yeah, Mantax most likely isn't a mage, warlock or necromancer, but people think he is. Yes, that is truly controversial and will be hard to somehow make in symbiosis with the canon. It came to me from the top of my head during the writing of this thread. It'd give Nocturn something interesting to his character. But I know this will most likely be rejected by the cast, Either way, it's a pitch! Some stuff has to go away! This is the most controversial thing in this topic. All the warlords were pitched to be dark, cruel and mature, and that might not be what you're looking for in a kid's line. My justification is that during '07, G1 got a turn darker aswell, but not as much as here. These Barraki don't have to be shown their cruelty, just as torturing Matorans 'Kalmah Style' or the brutality of Carapar directly. Hints could be enough, maybe a story here and there about them. How did the Barraki get to present time? This would be solved with Karzahni and his prison being present, but when it isn't, it might be a problem. It was originaly pitched that the prison where Karzahni and the Barraki were to be imprisoned would keep them alive forever and protect them from everything, as a mean of punishment. This isn't as big of a problem so I won't adress it as much. This is a pure speculation. I thought the pink/teal color scheme might look cool, but someone could mistake the Matorans for the ones of Lightning Tribe. Then again, @Noupix's other color scheme might be too dark and remind people of the Water Matoran. It will be difficult to choose the right one. Yes, how could the Barraki from the first image by @Tempelbeast1 transfered to minifigure form? But the same problem goes with the Rahkshi, like Guurahk. How would the Toa get to Mahri Nui? I just want to say that the Barraki meeting the "Toa Vahi" (Narmoto, Kivoda, etc.) would make some extremely interesting lines of dialogue, such as between Pridak and Kopaka, because the previous Kopaka was pitched to be Pridak's sister. Or Takadox and Gali, since the previous Gali let a mob to murder Takadox's wife. I am actually planning to write a short story about this meeting one day. Either way, how or why the Toa would go to Mahri Nui is entirely up to you, I honestly can't think of a reason for them to go. Very well, that is it! Thank you very much for reading, at least I hope one of the cast members did! If you have, please, adress my justifications to these issues if they rise up during the podcast. Thank you for your work on G3! I have an idea and drawings for how to add the tail to the minifigher. 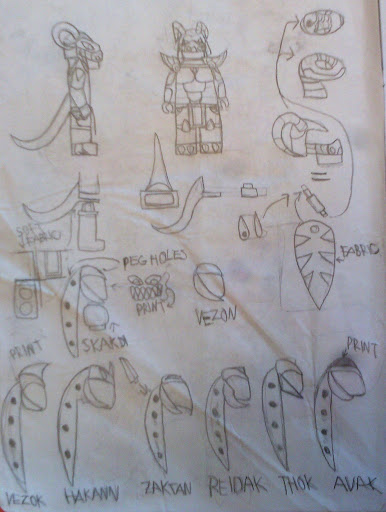 Only the sketch also shows things for vortixx heads and skakdi heads and spines etc. but the tail works the same way. 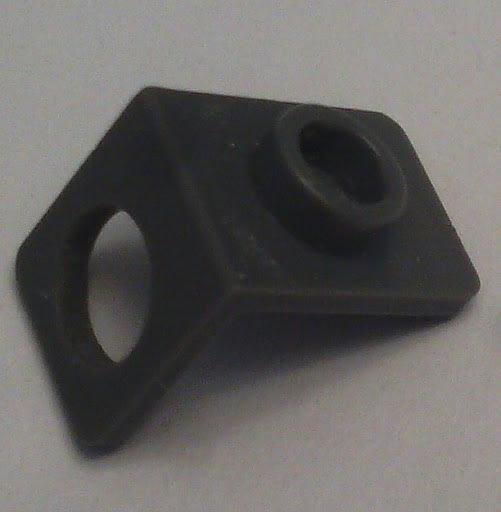 The tail is like this part, but it's made for a waist. Kalmah has such cute T-rex hands. Now I know why he is a villain, you would be if you couldnt reach stuff up easily your entire life. Thats also why he has tentacle arms now, so he can finally reach all the things. About Karzahni: I think Karzahni is actually better here than in the other one. About Mantax: Maybe he's actually an accomplished engineer, who's invented devices so advanced for its time they are considered magical artifacts. About Nocturn (and build): Maybe Nocturn could have the General Grevious-like minifigure torso (post-mutation), with the four arms in it and such. And technically, he's no longer a Lightning Matoran since he's been mutated into something different. About the Toa Kanohi: Technically, they're the second known team, not necessarily the second ever. A nitpick, but otherwise a pretty good idea. About getting to Mahri Nui (Mahri): If it's past the 3-year plan, then there would have been a major tech revolution due to the Civil War. Maybe someone invents the first submersible (Nuparu and Kotu FTW), and the Toa Vahi are sent by Naho to investigate strange reports coming from the center of the bay. During the descent, the mutagen damages the sub, causing it to break apart and mutate the Toa to adapt to water. After that, The Toa will be trying to find a way to reverse the mutation. That's just some ideas for it, anyway. I think the finding of Mahri should have something to do with Idris. For some really, really strange reason, I am not able to edit the main thread anymore. This is weird, because I edited it 12 days ago to prevent the 1 month gap that does this. Despite this edit, the pencil still disappeared and I'm no longer able to edit the thread. I wonder if there is a way to undo this process, or if I will just have to bother a mod a 1000 times to edit the thread to keep it up to day. @Mod_Squad? Can you please tell us what is the reason behind this post no longer being editable, despite the 1 month gap between edits being non-existent? That still does not make any sense. I edited this thread two times over the last two weeks, I should be able to edit it now. What I mean is this (and I might be wrong): if you create a topic, you will lose the ability to edit it after roughly 1 month, no matter how recently you edit it. They really should remove that feature entirely. That still does not make any sense, the topic was created on july 15th, that makes it two months today. Either way, Plz remove this. ..
Made a topic asking the mod team about removing of this feature. If it is, I'll add the Rahi section to this thread. If not.. Well, maybe I could make a second thread where we could continue the brainstorm.. And then another one, two months later.. Removing the unability to edit old topics? I just checked the topic you made. They say you might be able to edit this topic!